It’s hard to believe that today marks another year’s passing since I started this blog. It has been an eventful year and so much has changed and yet so much is still the same. I write this sitting more or less in the same place where I wrote my first post 2 years ago (I think it was two anyways but I’m feeling too lazy to check) after a wonderful day out on the mountain skiing. Now I am getting ready to sit down once again and work on my Christmas Cast-On for the year and it feels just so remarkably similar. Looking back on this year I knit somewhere in the neighbourhood of 50 projects (or at least that’s how many I bothered to record in Ravelry), four of which were sweaters for myself which was the knitting goal that I set for myself a year ago and I also started a video podcast this summer which I have found that I really enjoy making (I have a few episodes in varying stages of completion to upload soon too!) I also finally started an instagram account (username TheLeaningLarch) which I also have been really enjoying and I post a lot of the things that I am working on there too. On the life side of things, I am nearly finished my undergraduate degree which I am finding hard to believe (where did the time go!) and I got engaged this year (just realized now that I never said anything about it on here). It has been quite the year looking back! As far as a knitting resolution for the upcoming year, I think that this year I am not going to challenge myself to knit a certain number of items as I have the past two years but instead I think that I want to make a commitment to finish (or frog) the many blanket projects that I have on the go right now (with the exception of my leftovers blanket as I won’t have enough yarn scraps to finish it for a long time yet). I have four blanket projects that I can think of off the top of my head that have just been sitting there for ages, some need me to knit more squares, crochet a border or even just to sew on the second half of the squares and I would really like to just finish them after all this time but I think that I need a bit of extra motivation to actually do it, hence making it my goal for the year. Who knows, maybe this way I will have them all done by the summer! On another knitting related note, anyone interested in seeing my Christmas Cast-On for the year? 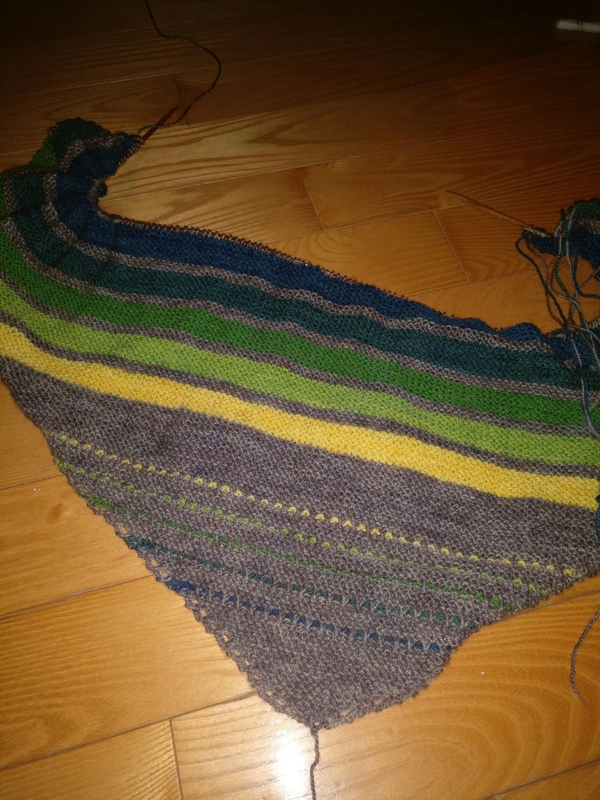 This year I am making the Beastkeeper shawl by Justyna Lorkowska and I am making it with Sweet Paprika yarns in their Cobblestone Pizzicato and Wind in the Willows Colourway on the Elora base. I decided to call this shawl Newt after Newt Scamander from Fantastic Beasts and Where to Find Them since I enjoyed the movie so much (I’ve seen it twice already!) and Newt is literally a Beast Keeper (plus newts are often green right? ) so I thought it was fitting. I am really enjoying this knit so far and it’s been flying off the needles, the pattern is simple but pleasant and the yarn is lovely to work with and the colours are amazing as well. I can hardly wait until it’s finished so that I can wear it! Anyways I think that’s all for now since it is New Years and I want to get knitting. So I just wanted to take a little more time and thank you all who have been sharing the past few years on the blog and/or for watching my podcast, it’s been great fun for me and I have really enjoyed meeting and hearing from you and I really hope that you have been enjoying it as well. I wish you all the best for the new year and happy knitting!